How could I not love this book? 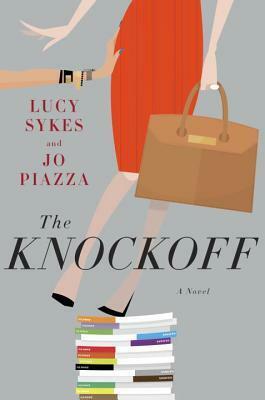 The Knockoff is Devil Wears Prada, All About Eve and The Social Network all in one hilarious, entertaining, utterly engrossing read perfect for a lazy Sunday afternoon. The fashion editor protagonist lacks Meryl Streep’s charisma and the conniving upstart lacks Anne Baxter’s subtlety and charm, but the story itself certainly gets right to the heart of today’s digital obsession. If Miranda Priestly is the iconic boss from hell of the early 2000s, Eve Morton is the boss from hell of the immediate present. When Glossy magazine editor in chief Imogen Tate returns to work after a six month hiatus, she finds her former assistant Eve Morton as the new editorial director, in charge of re-inventing the magazine as a digital app. Eve is a caricature of a millennial — completely addicted to social media, she interrupts her own wedding to update her Facebook status. (“It’s not official until it’s Facebook official!”) A Harvard MBA graduate, she has some great ideas for Glossy — Buzzfeed type lists and Buy It Now buttons that are guaranteed to boost traffic and improve conversion rate — but lacks the creative flair to take her vision beyond increasing ROI. Worse, she’s completely sociopathic and genuinely has no clue how clueless she really is. In contrast, Imogen has no idea what a hashtag is, nor what a conversion rate means. She may have Alexander Wang on speed dial, but lacks the social media savvy and business background to understand the changes Eve is making to Glossy. In today’s world, does she still have a fighting chance, or is she, as Eve says, truly a “dinosaur”? I had so much fun reading this book! I did expect a bit more about the real-life fashion world — Knockoff lacked the industry insider feel of Prada, and felt more like a story about office politics than fashion. There’s a subplot about Imogen’s daughter being bullied online, which Imogen compares to her own experience of bullying at work, and indeed, if you’ve ever had a school bully or a toxic co-worker, you realize how some people just never grow up. It’s a compelling tale, and seeing it from the perspective of a woman afraid of becoming irrelevant gives it an added emotional punch. I also like how accurate the story felt in terms of how much of an asset tech skills are in today’s world, no matter what your industry is. When Imogen goes out for drinks with some of her new, younger co-workers, she learns that in their life beyond the office, many of them want to start their own web-based companies. A tech entrepreneur Imogen meets at a conference comments that many of today’s big businesses — Air BnB, Uber — are successful because someone identified a gap in a system, a need that isn’t being met, and simply capitalized on that. With websites and social media, almost anyone can raise capital and set something up. It’s a quick, entertaining read, with a deeply satisfying ending. The Glossy app didn’t quite strike me as particularly innovative, but a secondary character had an idea for a vintage fashion/thrift shop type app that I would love to see happen in real life. Someone tweet me if it does. Thanks to Random House Canada for a copy of this book in exchange for an honest review. This entry was posted in Book Reviews and tagged 50BookPledge2015, Fashion, Fiction, Random House Canada by Jaclyn. Bookmark the permalink.